Apple’s latest version iTunes, version 8, seems to be causing some grief for Windows Vista users. According to reports, some users are experiencing a “blue screen of death” after plugging in an iPod or iPhone. Apparently having the device plugged in when the computer boots doesn’t make a difference. Some affected by the problem have been able to connect their iPod or iPhone to their Vista computer succesfully by first unplugging other USB devices, particulary HP printers and scanners. For some, however, this doesn’t help at all and even a clean install of Vista doesn’t make things work. Could it be related to a bad USB driver with iTunes 8? That’s what some users are guessing. Either way, seems safe to say it is related to Apple’s inexcusably poor QA as of late. Seems that they’ve adopted Microsoft’s “screw it, we’ll patch it later” mentality. Today in San Francisco Apple’s Let’s Rock didn’t hold too many surprises if you’ve been following the rumors leading up to the event. iTunes 8 was revealed that will include a new Genius feature to recommend new music to you based on what sort of music you seen to be listening to. The iPod Nano and Touch were also updated. The new Nano is quit a bit taller than the last model (which resembled a Chicklet) features a taller screen and an accelerometer to rotate your screen if you tip the Nano sideways (like the iPhone and iPod Touch) and also allows you to shuffle to another track by shaking it. The new Nano’s will be available this week and be available in 8GB for $149 or 16GB for $199. The new iPod Touch features the same look as the iPhone 3G and now includes a built-in speaker, external volume control (finally) and has integrated Nike+iPod functionality. The new Touch is available right now and goes for $229 for an 8GB model or $299 for a 16GB version. Oh, and it’s being referred to in marketing material as “the funnest iPod ever”. Another iPod, the Classic, was updated and now is only available with a 120GB hard drive for $249. This new model is available immediately and the two previous models, the 80GB and 160GB, are history. New iPod Nano design outted by 3rd party case? Many are expected Apple to hit us with an updated iPod or two in the near future, and one of the models expected to be getting an update is the Nano. According to rumors the next iPod Nano will be taller, more like the form factor of the first generation Nano’s, but thinner and with a widescreen display. Of course it could all be wrong but there are enough people talking about the new design for me to believe there’s something to it. August 25, 2008 | Categories: rumors, tech | Tags: apple, ipod, leak, nano, tech | Comments Off on New iPod Nano design outted by 3rd party case? Next iPod Nano to be taller, more like first generation? You know you have a good design if Apple wants to borrow it. According to a new rumor about the next-generation iPod Nano, it will be taller and match the aspect ratio of the iPhone, so 1.5:1 instead of 1.33:1. The overall shape of the next Nano is said to be more like the first generation iPod Nano with a all and narrow look and not the Chicklet-like styling of the current model. The last update to the Nano was on September 5, 2007 (date courtesy of Mac Rumors Mac Buyer’s Guide) so with it nearing the one year mark it is due for an update, so we know that whatever the design will be we’ll see it soon. 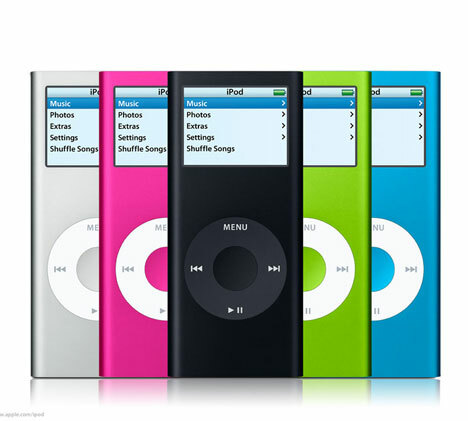 July 30, 2008 | Categories: rumors, tech | Tags: apple, ipod, nano, tech | Comments Off on Next iPod Nano to be taller, more like first generation? Most of the update news out of Cupertino is about the 2.0 firmware update for the iPhone and iPod Touch, but Apple has released an update for their 1.1.4 iPod Touch firmware, making the latest version without paying $9.95 for the 2.0 update version 1.1.5. Not much seems to be different about the 1.1.5 update so it must be just a few bug fixes. No new features have been added. If you have a first generation iPhone or an iPod Touch, good news about the 2.0 firmware update–it’s available now via iTunes. In addition adding support for MobileMe, the 2.0 firmware adds support for the new App Store where you can download and install new applications and games for your iPhone or iPod Touch either via the iTunes Store or directly from your device via the new App Store application. iPhone users can get this update for free while iPod Touch users will need to purchase the update for $9.95. Although Apple is still working out some bugs with their MobileMe rollout, that hasn’t stopped them from releasing a new update to the Apple TV to support the new MobileMe service. The interface seems unchanged except that under “Photos” where it used to say “.Mac” it now says “MobileMe”. A nice little surprise about the new 2.1 firmware update is that it also adds support for Apple’s new remote control application for the iPhone and iPod touch which will let you remotely control iTunes as well as the Apple TV. 24 Hour Fitness has announced that they will be bringing in new gym equipment featuring support for Nike+ iPod connectivity to several of their locations in New York, San Francisco, Miami, Denver, Portland and Salt Lake City. The new machines will allow you to record data from your workout and upload it to NikePlus.com where you can keep track of your stats and challenge others from around the world to a virtual race. Look for the new equipment to arrive sometime in July. For more info about Nike+ check out the official page here. Check out the full press release here if you’re interested. According to a survey of developers at Apple’s WWDC conducted by Piper Jaffray analyst Gene Munster, many of the apps heading to the App Store (pending approval from Apple) will have an average cost of $3.00 or less. Even more surprising, according to Munster’s data 71% of the apps will be free! Half of those surveyed said that they plan to develop apps for only the iPhone, while the other half said that they plan to develop apps for the iPhone, iPod Touch, and Macs. I was planning on going for the 8GB iPhone 3G but now that I’ll be filling it up with free stuff I’ll probably need the 16GB version. Darn. Microsoft has announced that their Zune media player has passed the 2 million sold mark, growing their market share from three to four percent. For some perspective, last quarter alone Apple sold 10.6 million iPods so Apple really hasn’t got anything to worry about for the foreseeable future. Creative, however, has dropped from four down to two percent marketshare. SanDisk remains strong in second place with 11 percent.